Yes, ladies and gentlemen, everything in the house is waterproof, including the ashtray on the table. 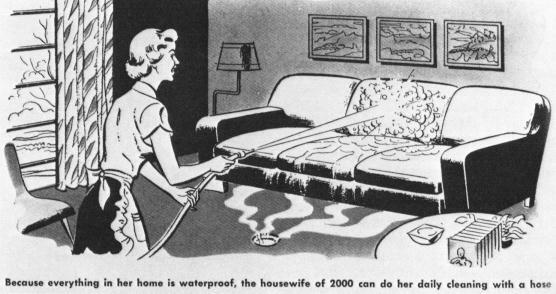 In case you're wondering why the little woman is hosing down the couch, she has just stabbed her husband through the heart with a ten inch chef's knife, because he insisted that she continue to dress like Donna Reed even though it is the twenty-first century. But that's the handy thing about the drain hole in the middle of the living room floor; all the blood washes clean away. Actually, I saw this same picture as part of a museum exhibit that was part of NASA's 50th anniversary celebration. Love it! Oh what fun! The hairstyle is so 21st century too. i'm pretty sure she's a fembot.